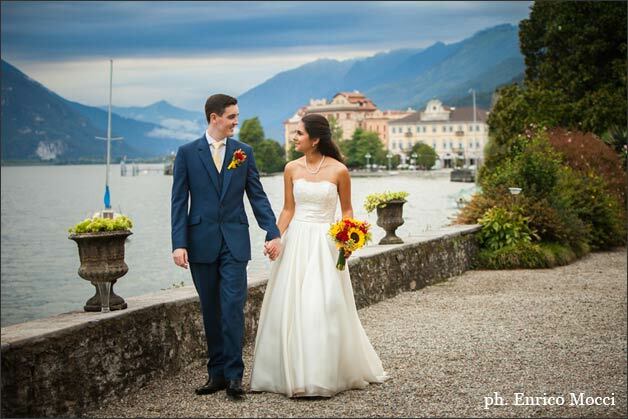 ’m very happy to get back to Lake Maggiore in occasion of Sonia and James’ wedding! 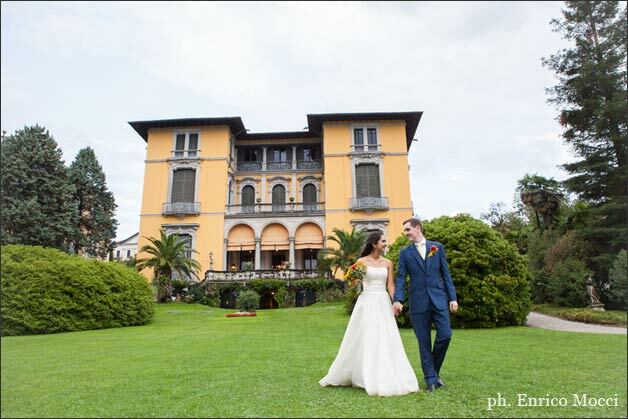 We are back to Villa Rusconi Clerici after a while for a romantic country style wedding. 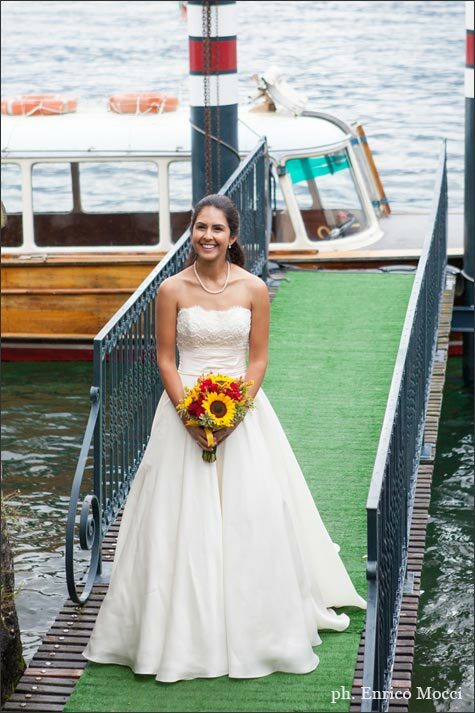 Bride arriving on a boat, an outdoor ceremony, sunflowers country details in wood, a great dancing party and a sweet group coming from UK, Italy and India to celebrate a great day. 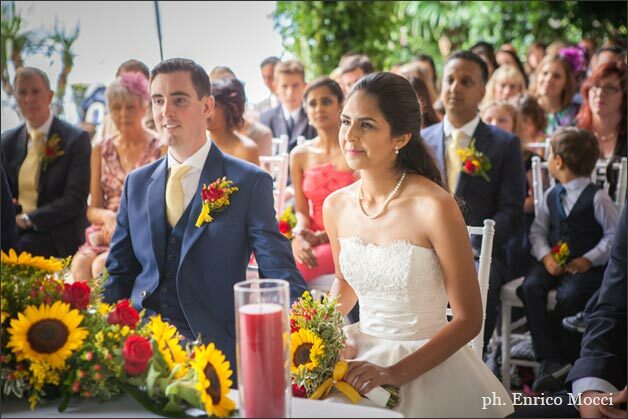 Sonia is a wonderful Italian-English-Indian girl. She is incredibly sweet and I had the occasion to meet her last year with her husband to be and her lovely Italian mum. 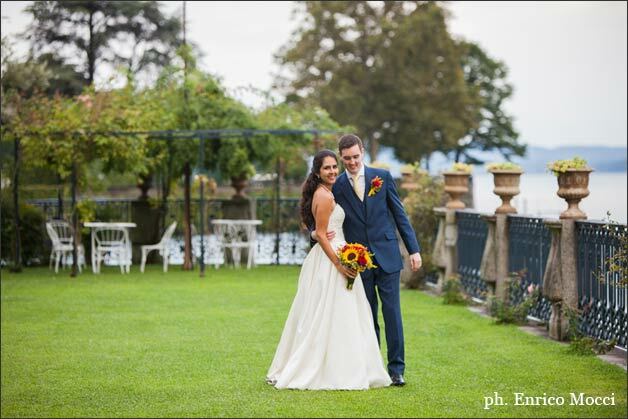 They all fell in love with Villa Rusconi Clerici and Lake Maggiore at first sight and they decided that that was the right destination for their Italian wedding. 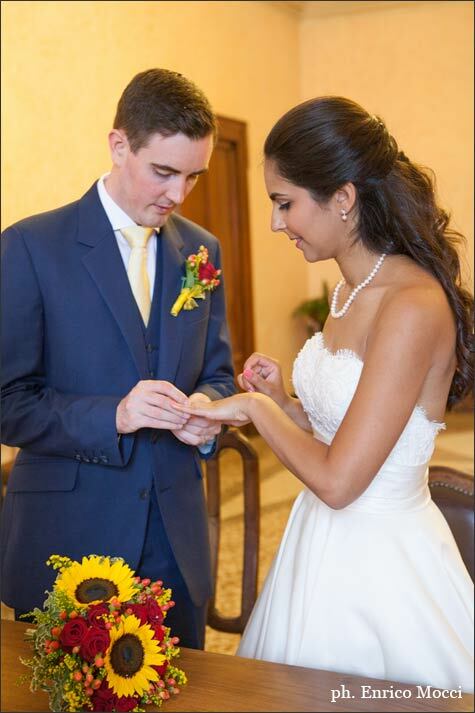 Planning Sonia and James’ wedding was a great occasion to meet and know them more. 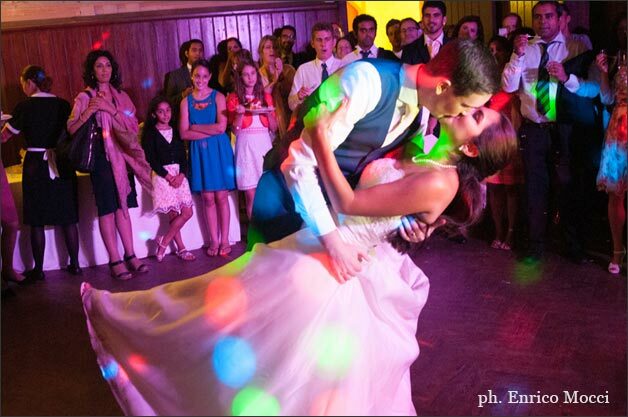 I had the pleasure to share with them a great moment of their lives and I’m grateful for that. 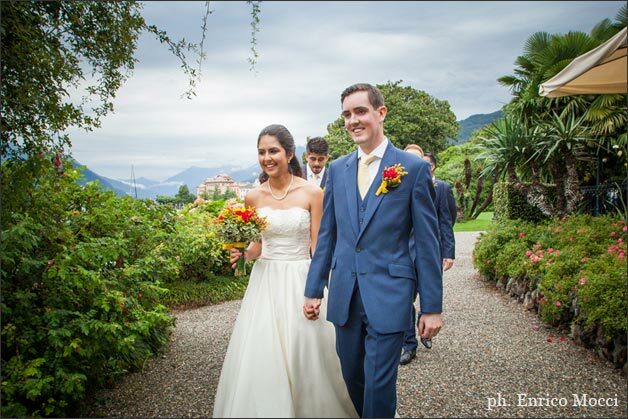 Sonia and James decided to stay in Baveno at Grand Hotel Dino for the getting ready so video maker Alberto Lavezzo and photographer Enrico Mocci reached both there. 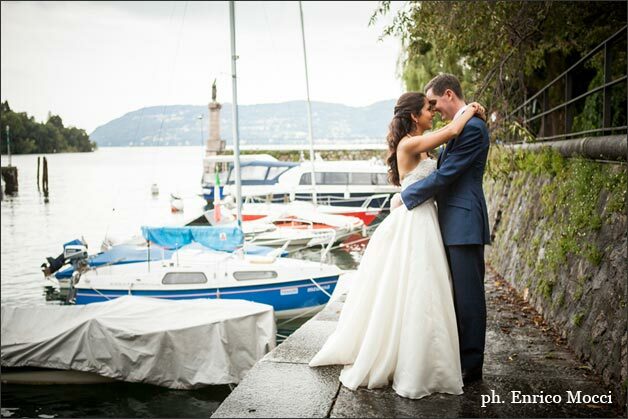 Once ready James and all guests got on motorboats waiting for them to reach Villa Rusconi Clerici that is located just in front of Grand Hotel Dino, on the other side of the lake. Refreshing drinks were waiting for guests once arrived at the Villa and all took their seat waiting for Sonia who arrived with another boat right after them. 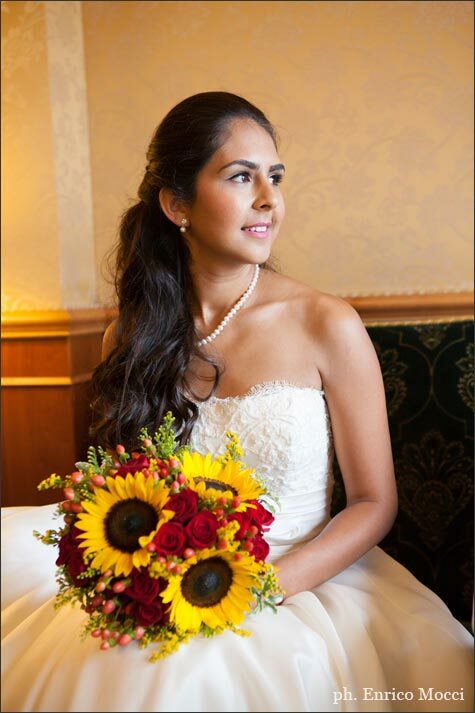 Sonia was absolutely beautiful in her ivory wedding dress, simple but very elegant. 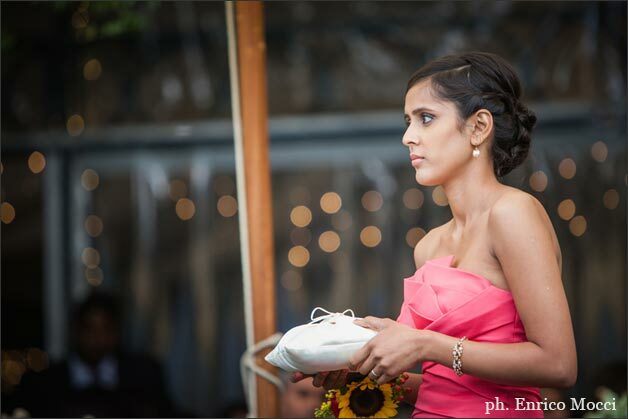 A simple hair do and pearls necklace a classical must-have for an elegant and romantic bride. 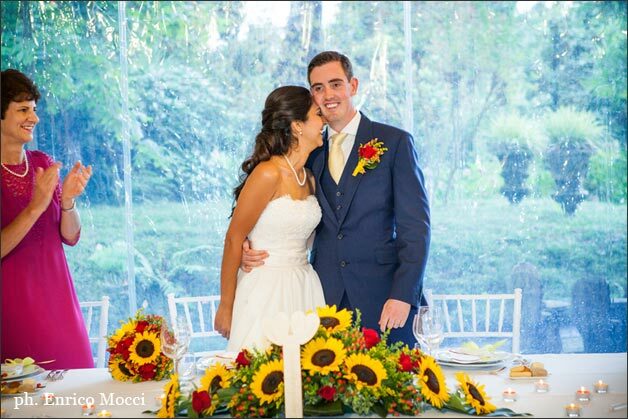 For her bouquet she chose a country and romantic style: sunflowers with red roses, hypericum berries and some greenery. The final result really matched her joyful style. 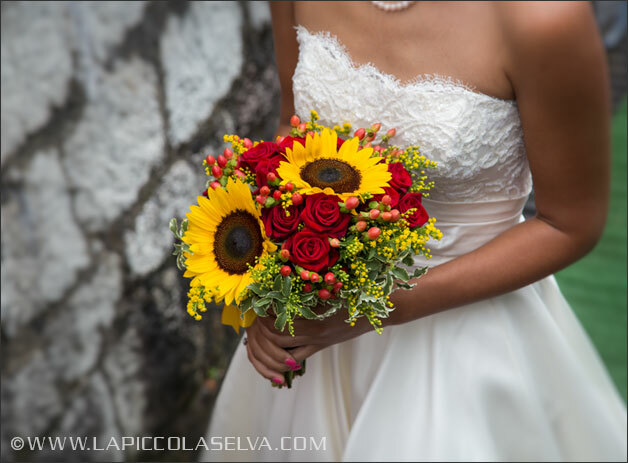 La Piccola Selva Team created it for her keeping the same style for all the other decorations at the villa: centrepieces, button holes and ceremony decorations too. 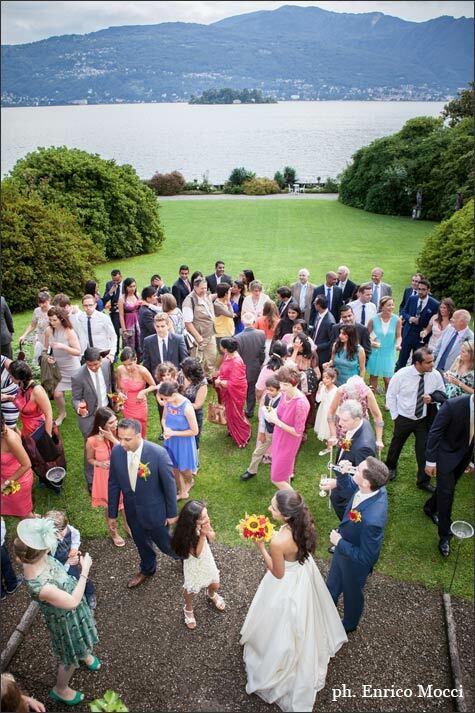 As the town hall is located literally next door Villa Rusconi, right after the blessing at the villa, Sonia James and bridal party left on a boat to reach it and make it legal. 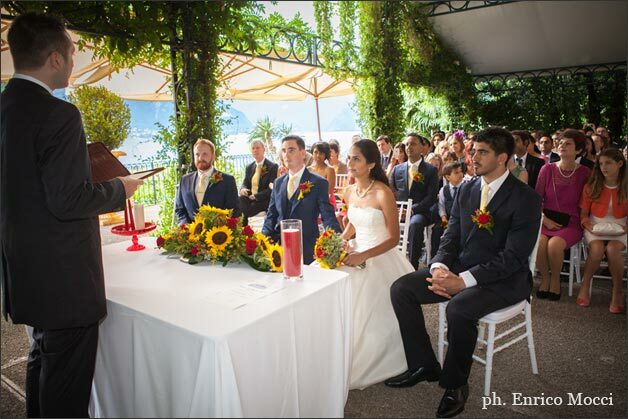 It is a very good option if you are keen for an outdoor ceremony at the reception venue with a legal value. 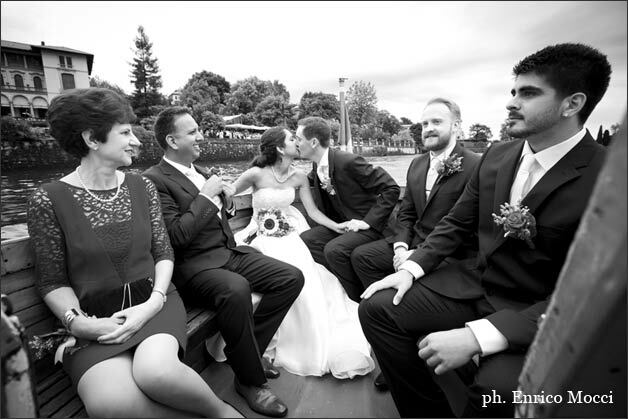 A boat trip could also be a good occasion for wonderful wedding photos and an intimate moment for bride and groom. And what if the boat is very special too? 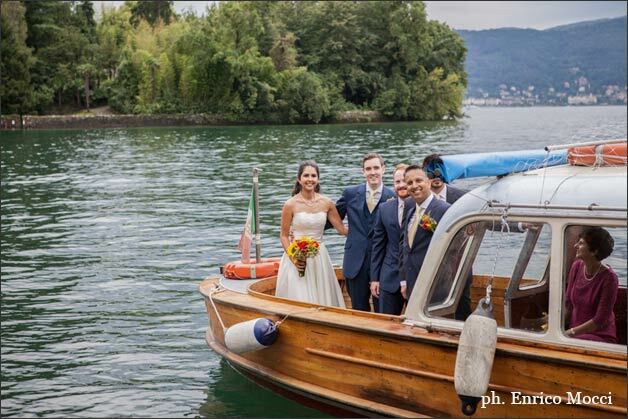 Sonia and James’ bridal boat is the most ancient on Lake Maggiore! It is all in wood and it is open at the back. 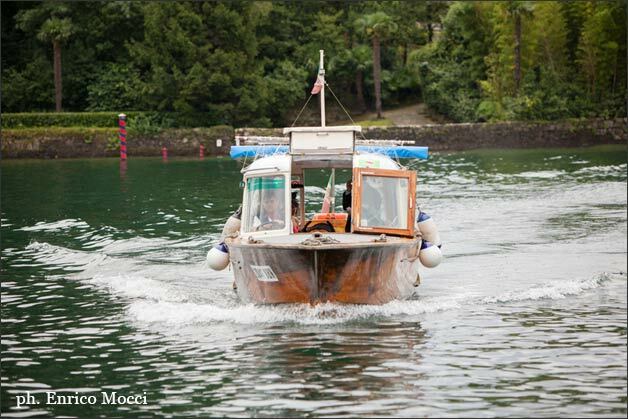 It is ideal for photos and it is a real piece of history on water! 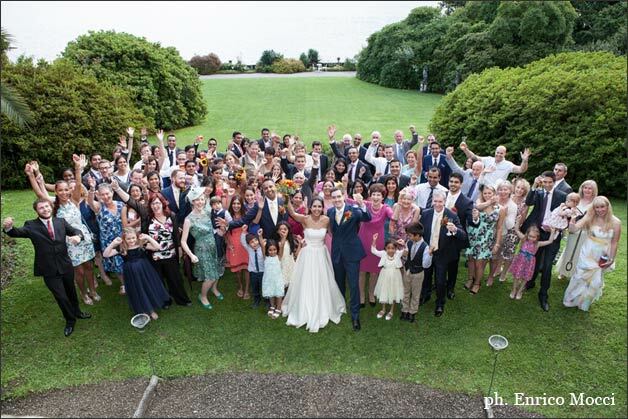 Once back to Villa Rusconi Clerici Sonia and James joined their guests for the aperitif and had the occasion to have some group photos in the stunning gardens of the villa. 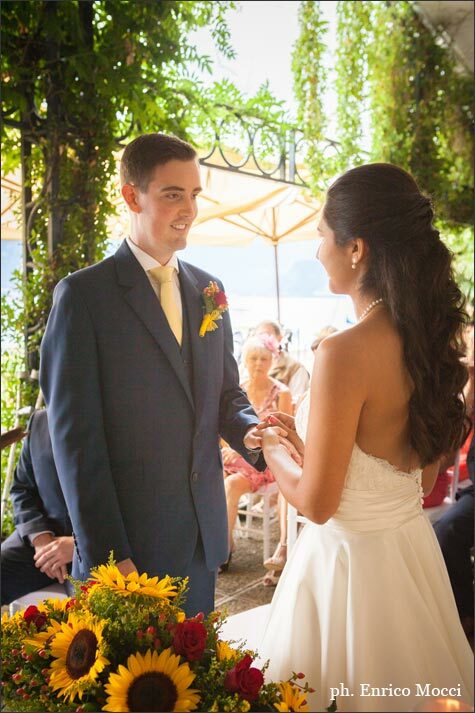 When dinner was ready under the pavilion all guests moved in it and Sonia and James made their entrance on the notes of Bitter Sweet Sinphony by Verve… very emotional! 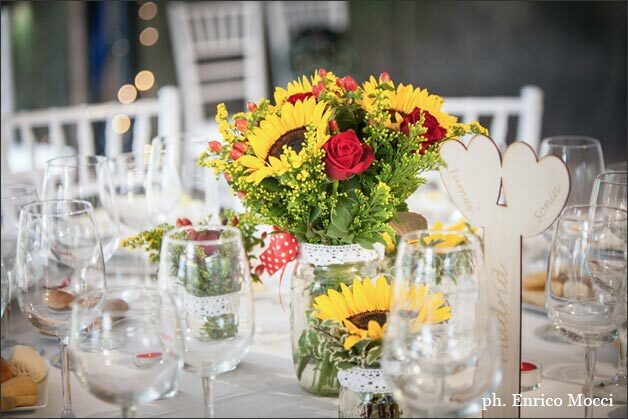 Dinner was simply delicious and decorations on the tables were very sweet too: sunflowers, hypericum berries and roses were placed in country style jars of different dimensions. 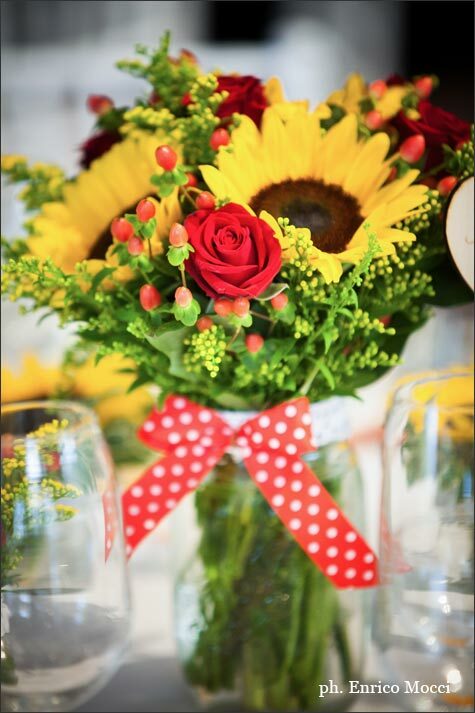 Jars were all decorated with vintage laces and red poke dots ribbon, some red tea lights did the rest. 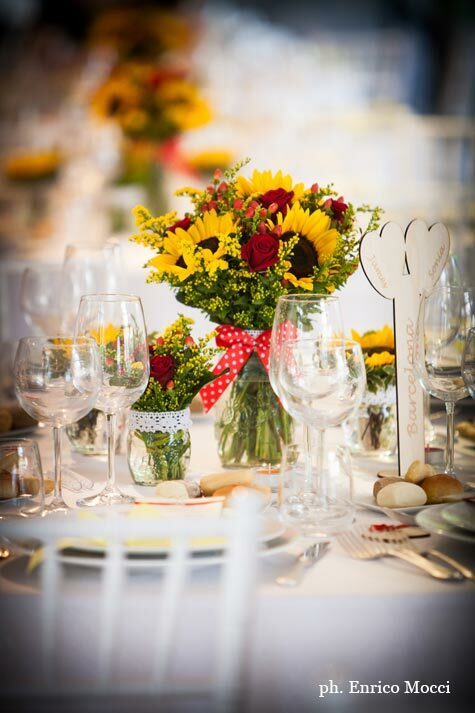 As wedding stationary, Sonia created for table and guests wooden table names and place cards in the shape of hearts. 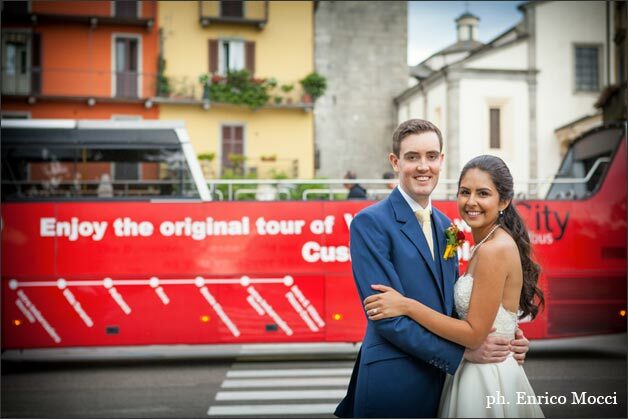 Names cars in particular could be a lovely mementos for the guests. They could be re used as key rings or similar. What a nice idea! 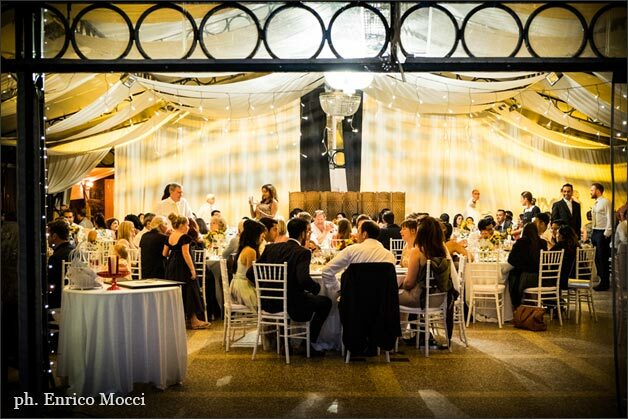 To make the atmosphere even more joyful pavilion was decorated with amber lights and lots of fairy lights to create the right mode for a fun reception meal overlooking Lake Maggiore. It is time for the cake! 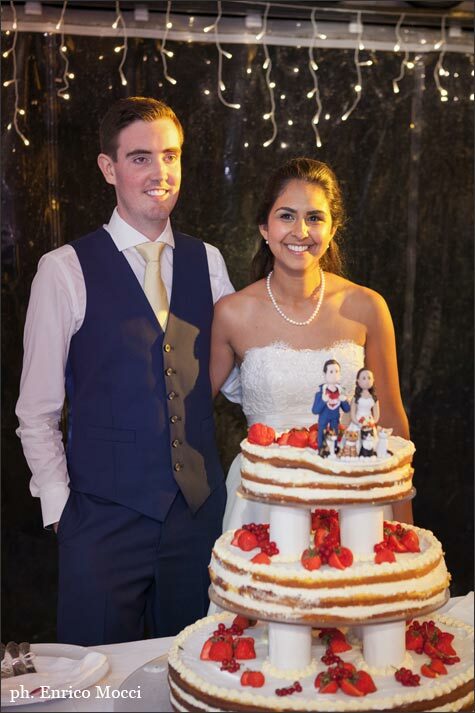 Sonia and James’ favourite, sponge cake in layers with no icing, a romantic country choice here too with a very special personalised cake topper! Have a look at it, isn’t it sweet? For the after dinner the group moved in the cellar of the villa where music, dances and drinks made the night special. The final surprise was a real pizza cooked at the moment by a pizza maker – pizzaiolo – for a midnight pizza that everybody loved! 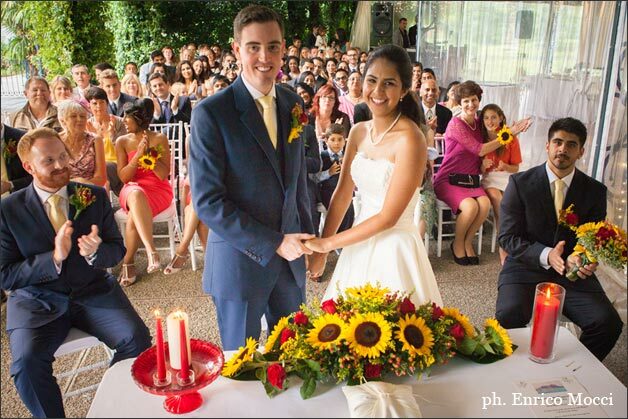 Congratulations Sonia and James and thanks for sharing with us your special day! 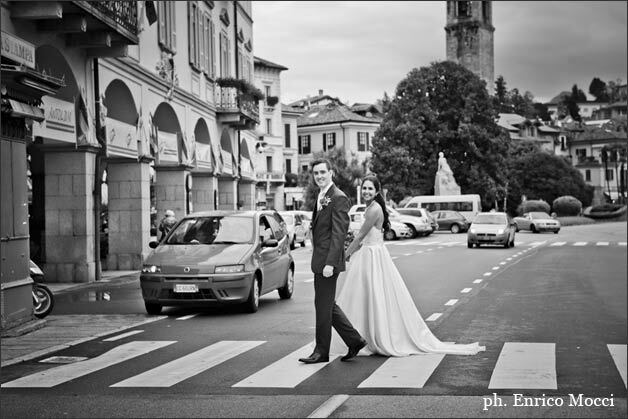 A special thanks to Enrico Mocci for the great shots you can see in this post.